Description: Barefoot this moving boulder of a Dwarf is 4 feet tall by his people’s measurements (1.2 meters by Elven metric), and 200 pounds. As a Prince of the Korin Thatr his beard is braided into a massive singular “Thane’s weave” with Korobite (gold & silver looking metal, used in Old Kingdom Dragon Coins) bands. He bears a genuine royal Dwarven signet ring! The only armor he wears on his arms are leather and steel forearm bracers and Korobite knuckle studded leather gauntlets when fighting. All of his boots have Korobite plated toes and steel shanked heels. Most of his robes are plain “for a prince,” and he will often go bare chested. Both of his arms bear tattoos up to his chest and shoulder blades. While almost never seen his right palm bears a tattoo of the “Eye of Ra” to guide it in being just. His left palm bears “Bennu’s flaming Phoenix Bird” to guide it to where retribution is needed. 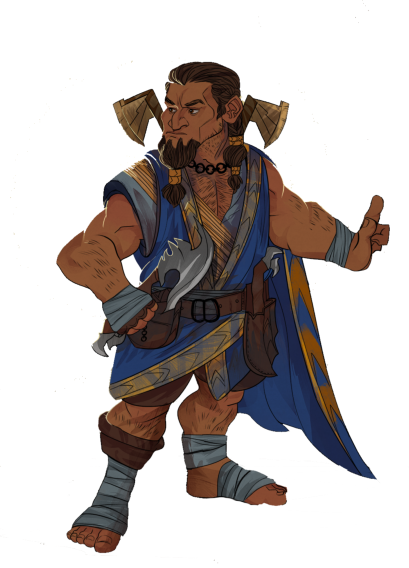 Torrun is the youngest surviving direct line descendant of the Dwarf King Ithan, whom had a suit of ruinc armor that inspired a spell to be created mimicking a pale portion of its power. His sister, Queen Disvanoa ’ekun Ithansottir the First, is the current owner of that armor and Queen of the Dwarven domains within the dimension of the Compound. Very recently, the Queen had taken a consort from among the Thanes of the Compound and she has produced an heir. Torrun was the first to start the process of relinquishing his right to the throne as heir, though as family he has kept the ancient title of High Thane, or Prince is the easiest translation in elvish. The Dwarves have kept the ancestral name of the realm they hope to return to one day so they may spread peace among the peoples of Palladium – Korin Gilead (Fortress Birthstone). Together with the last of the Royal Elven Families of the Golden City of Baalgor they have fought to rid the war among their kind. The last hold outs these five and a half thousand years have been the ancient races that used to be slave stock for both factions of the Elves and Dwarves when they went to war millenniums ago.